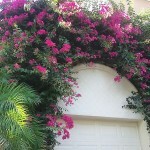 Distribution and habitat: Bougainvillea glabra is an evergreen, climbing shrub with thorny stems. 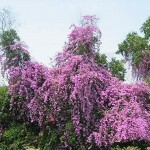 It usually grows 3-4m (10–12feet) tall, occasionally up to 9m (30 feet). Tiny white flowers usually appear in clusters surrounded by colorful papery bracts, hence the name paperflower. 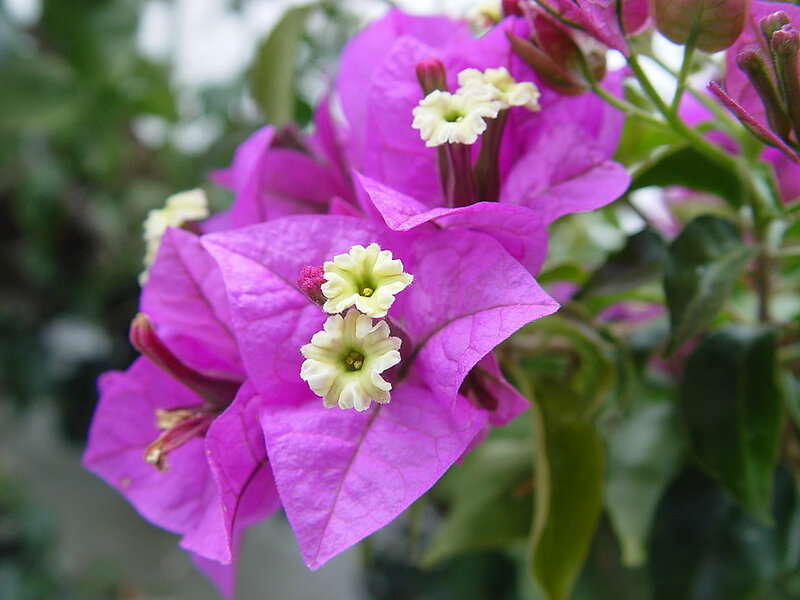 Bougainvillea glabra is native to Brazil growing in well drained sandy desert soils, slopes, mesas and disturbed rocky soil in a broad elevation range, anywhere from sea level to 750m (0-2500 feet). Its natural habitat is equatorial where day and night lengths are almost equal. 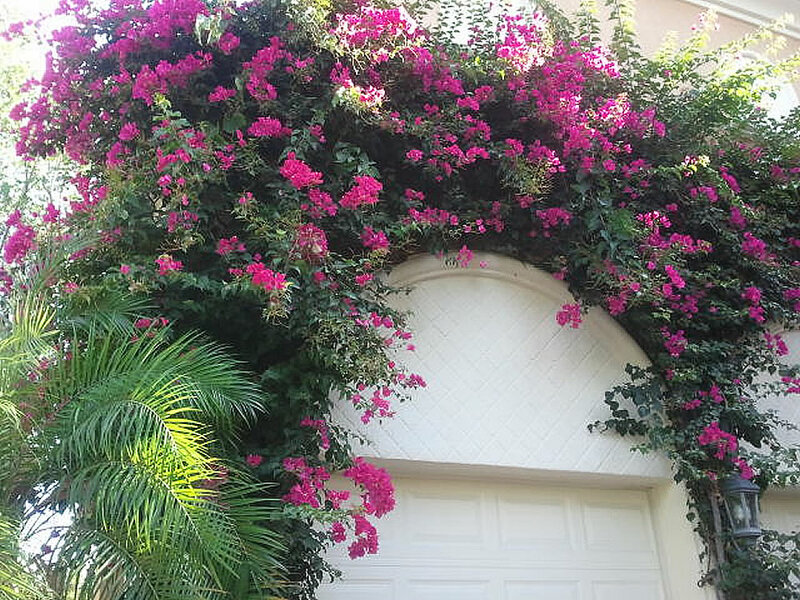 Bougainvillea glabra in these areas tend to bloom year round. Elsewhere, best blooming occurs when the night length and day length are almost equal (in spring or fall). 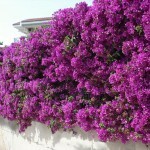 Description: Bougainvillea glabra is a vigorous climbing species, which flowers at an earlier age than most kinds. It is a subtropical woody plant armed with spines. Though normally climbers – as seen outdoors in warm climates – they can be trained and pruned to keep them bushy indoors and there are some recently introduced dwarf-growing kinds that remain bushy without special attention. Their oval leaves are sparse and uninteresting, but they have decorative papery bracts surrounding small cream-white coloured flowers. The bracts appear in clusters of 10 to 20. Purple or magenta bracts are produced in late summer and fall and the varieties include other colours. They tend to flower all year round in equatorial regions. Elsewhere, they are seasonal, with bloom cycles typically four to six weeks. But the real flowers are tucked away inside the papery bracts from summer to autumn. Houseplant care: Bougainvillea glabra are not easy to grow indoors. 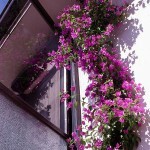 Because they require better condition than are normally available, they are grown most successfully as windows plant. In naturally warmer areas they will do well in sunrooms or conservatories. These plants have spines; use extreme caution when handling them. 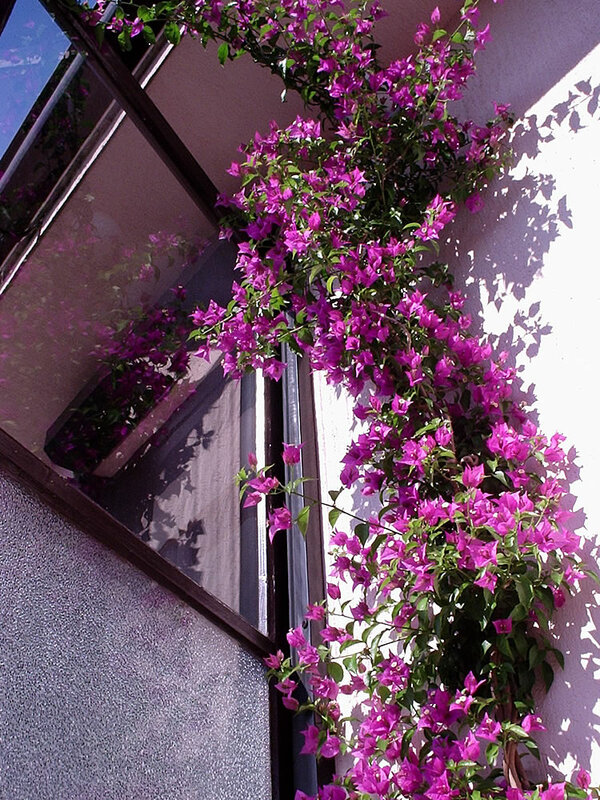 Light: In order to flower, Bougainvillea glabra need at least four hours of direct sunlight every day during the active growth period. And they must have bright light at other times or they will not thrive in an indoor situation. Temperature: Normal room temperature are suitable during the active growth period. In the winter rest period they should be kept cool but not bellow 10°C (50°F). Watering: Water actively growing plants moderately, giving enough to moisten the potting mixture thoroughly; allow the top two-thirds to dry out between waterings. Amounts should be drastically reduced as the rest period approaches and the potting mixture should just be kept from drying out. Feeding: Begin applications of a complete liquid fertiliser as soon as growth starts in early spring and continue the applications once every two weeks throughput the flowering period. Potting and repotting: Use a soil based potting mixture with a little extra peat moss well mixed in. Move young plants into pots one size larger in early spring. Disturb the roots as little as possible because the plant might go into shock and take weeks to recover. 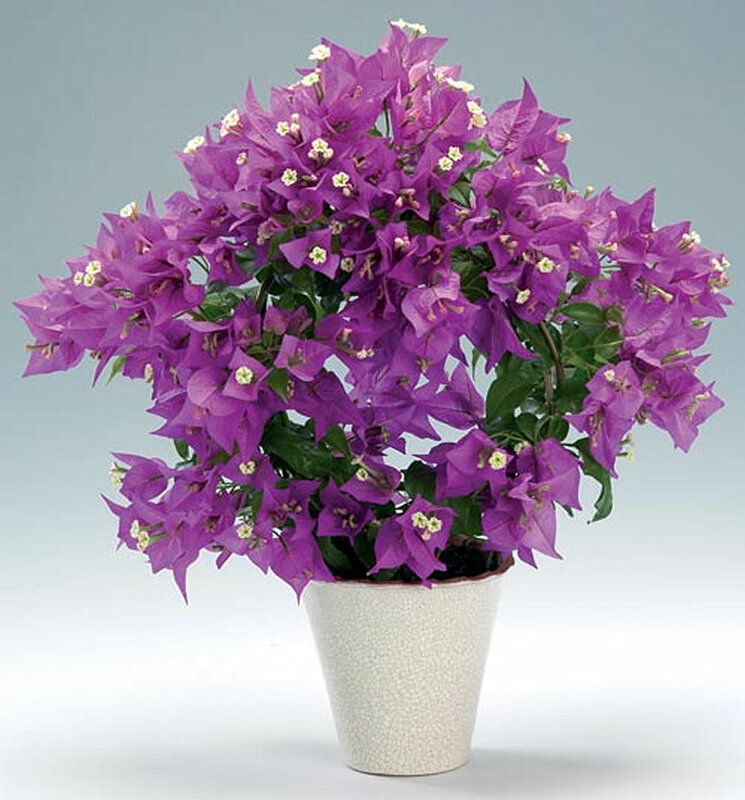 Bougainvillea glabra blooms best when pot-bound. Do not repot these plants in pots unnecessary large. Annualy top dress these plants with fresh potting mixture. 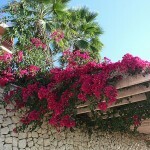 Gardening: Bougainvillea glabra is heat and drought tolerant and frost sensitive. They can usually tolerate die back from a freeze, but will withhold blooms for a while. If unsupported, these plants will remain compact or behave as ground covers, while if given support they will climb vigorously, using their sharp thorns as a means of attachment. 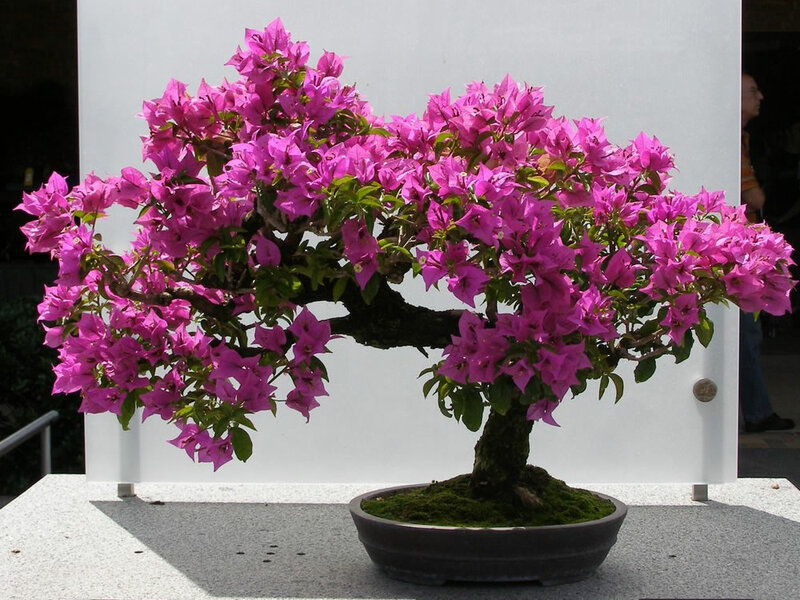 Also, Bougainvillea glabra takes well pruning which is a useful attribute in styling bonsai. Because these plants generally blooms on new growth, each branch, as blooms begin to fade, should be cut back to a point somewhat shorter than the desired length. Seal all cuts to prevent rot. If rot is detected on a collected specimen, cut it out completely. 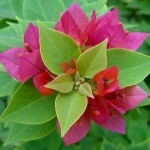 Position: Bougainvillea glabra needs full sunlight, warm weather to flower well. The length of time they will bloom is dependent upon the health of the plant and the environment they are in, the more sun and heat, the better. 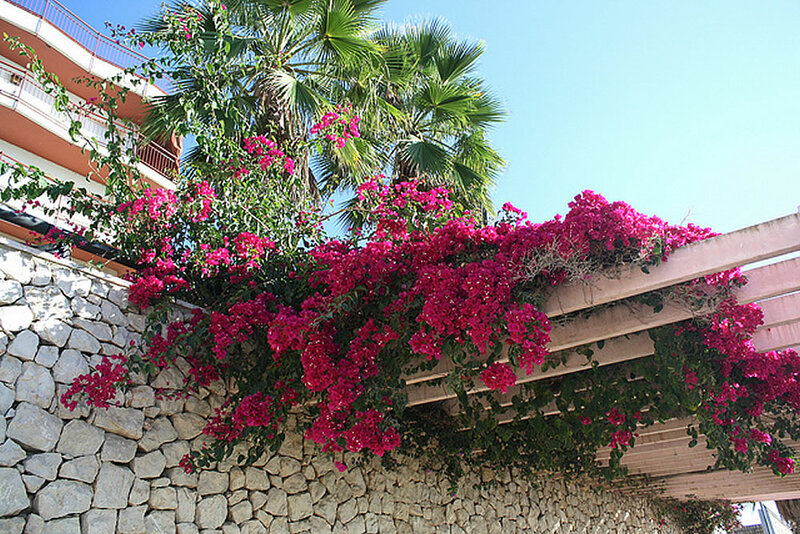 However, long days and short nights limit a Bougainvillea glabra ability to bloom, this plant preferring equal days and night length as flowering season. It is rampant by nature and will cover a whole shed or large tree stump – but it is best trained over a trellis against a warm wall. 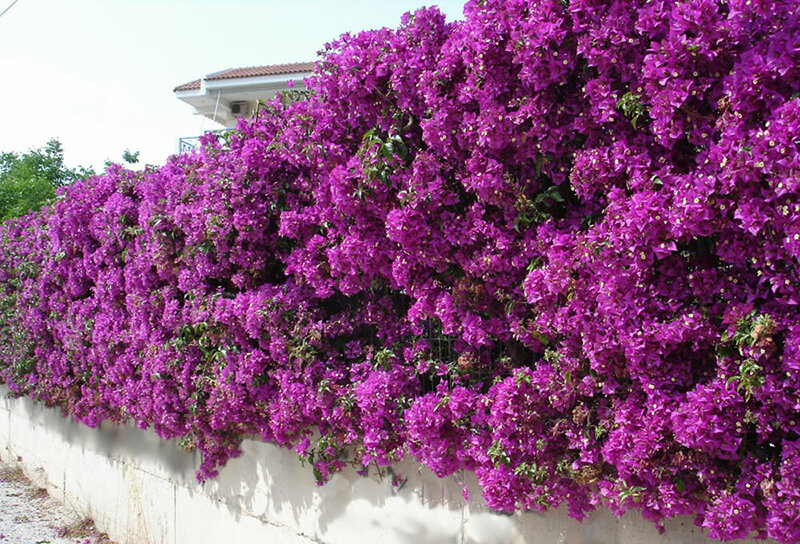 Soil: For best results, plant Bougainvillea glabra in a light well-drained soil. Irrigation: Although drought tolerant, they need plenty of moisture during the flowering season. Give copious quantities of water in the hot weather, but allow almost to dry out in winter. Fertilising: Fertilise once in the spring with a low nitrogen fertiliser and maybe once again in the fall. Propagation: Cuttings of new growth 15cm (6 inch) long may be taken in spring. After dipping the cut ends into hormone rooting powder, insert them in a moistened equal-parts mixture of soil-based potting mixture and coarse sand or perlite. The potted cutting should then be placed in a heated propagating case and kept at 23°C (73°F) in bright filtered light. Roots will form in eight weeks after which plants can be repotted in standard mixture. Considerable care is required when repotting to avoid damage to the delicate roots of the young plants. 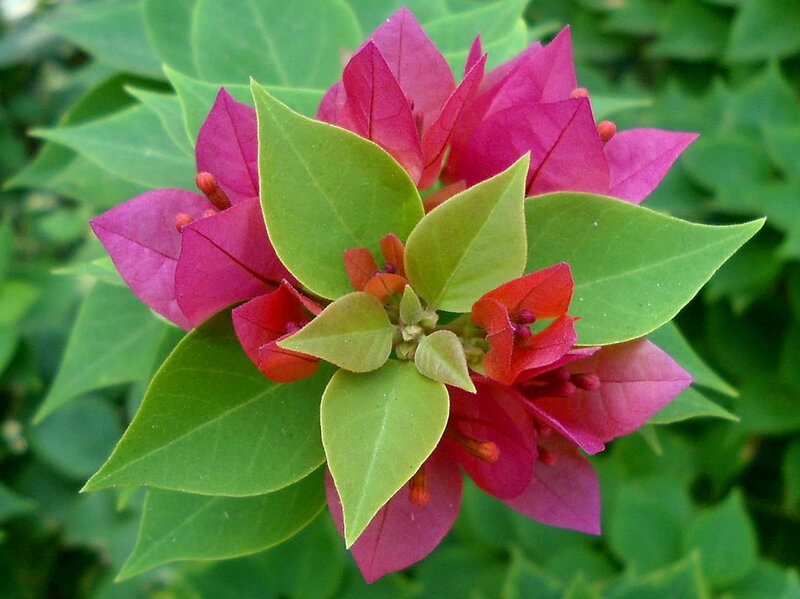 Problems: It is not common for Bougainvillea glabra to be affected by pests and diseases, but some problems may appear due to unbalanced feed and poor conditions. Overfeeding will produce masses of foliage but very little in the way of colorful bracts. The old established method of forcing flowers is to withhold water to a point of causing severe stress to the plant. Caterpillars, aphids and scale may infest Bougainvillea glabra plants. Treatment: Use a suitable pesticide to eradicate these pests. Nitrogen deficiency: Older leaves turn a pale green and the veins are usually a reddish color. New growth will be stunted. Phosphorus deficiency: The veins will turn red to purple and the plant as a whole will look purplish. Potassium deficiency: Causes the edges of older the leaves to be a purple color and the leaf tips will be a brownish color. Magnesium deficiency: First appears on older leaves where they turn a spotted yellow or tan color. Zinc deficiency: (rare) Will look almost like magnesium but here the leaf will be twisted. Iron deficiency: Young growth is stunted and pale, but the veins on the leaf remain green. Calcium deficiency: Dead areas appear in young growth and the tips soon die. Treatment: Recommended remedy for any of the deficiencies above is the application of a complete micronutrient blend. Root rot will appear when plants are over-watered or are subjected to water logged conditions. Treatment: These situations are easier to be prevented. Apply a broad spectrum fungicides during transplanting or planting in landscape. Fungal and Bacterial Leaf Spot (Pseudomonas and ropogonis) infections appear as dark necrotic spots on leaves and bracts and puckered and distorted growth. Defoliation will occur when leaf spotting, blighting or marginal necrosis becomes severe. Care must be taken that fungus does not invade other trees and shrubs around. Treatment: Maintaining dry foliage is the primary control measure. Remove and dispose infected leaves and/or plants from the growing area. Apply fungicides as preventive measure. 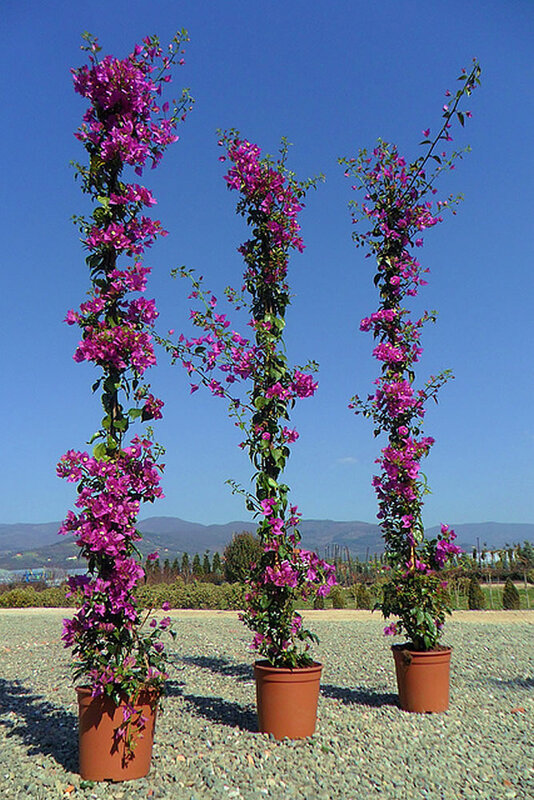 Uses and display: Bougainvillea glabra can be easily grown as a hedge, an arch or a tree on the ground and in pots. 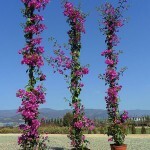 It is a characteristic porch and arbor vine in warm countries and sometimes grown in greenhouses. 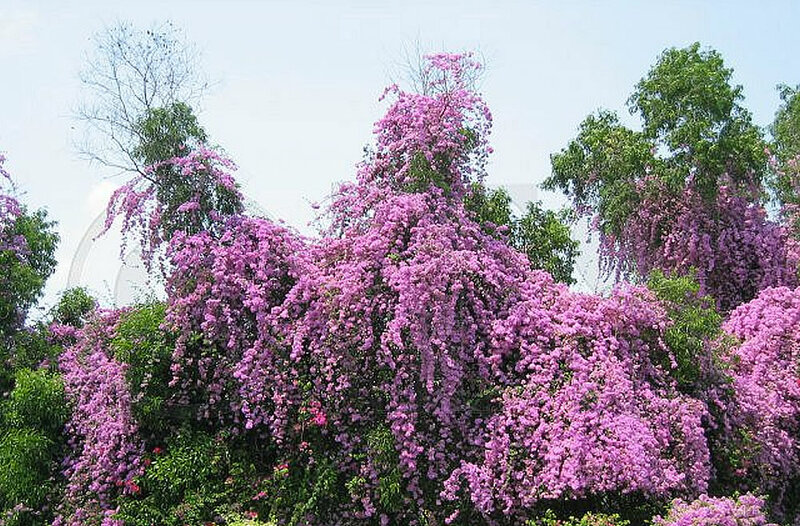 It can groomed as a ground cover, pruned as an espalier, trained as a tree or contained in a pot in a variety of shapes. 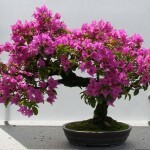 This plant is ideal for bonsai. Also, this plant can be grown in hanging basket with a hard pruning to maintain the shape and size, making a splendid specimen for balcony or sunroom.